I had some mixed feelings about the first book in this duology? series? so I was a little bit hesitant about picking this book up, but I was actually quite pleasantly surprised to find that I enjoyed this book even more than the first one! 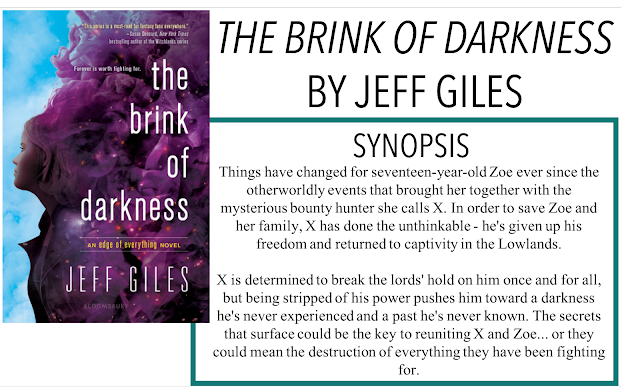 I'm here with another book review, The Brink of Darkness by Jeff Giles. Thanks so much to Raincoast Books for sending me an ARC of this book for an honest review, as always, all opinions are my own. The story picks up where we left in the first book. I'm not really going to say too much about the general plot because I don't want to spoil too much. X has been sent back to the Lowlands and likely won't see Zoe again. He is on a mission to find his parents and get some answers. Zoe is reeling from X's departure and everything that happened in the first book and now has to try and live her new life with many questions. I loved, loved, LOVED the fact that the majority of this book was set in the Lowlands. We got a little bit in the first book, but I think there was so much set up in that one that you couldn't really enjoy the whole setting. In this book, however, we follow X on his journey through the Lowlands and the different people he meets there. For me, this really elevated the story and made it much more engaging. My problem with urban fantasy is usually that it leans more on the real world than the fantastical, and this book did the opposite - which I was definitely here for. The relationship between X and Zoe is still a bit much, a bit quick for me, and that is something that is actually addressed in the book. Val, Zoe's friend, is worried she has fallen too hard, too fast. Zoe tries to explain her feelings and for the most part, the matter is dropped, but it just really stood out to me, the way in which her friends checked in on her and made sure that she felt like she knew what she was doing. I loved the historical vibe some of the characters in the story had - we got some great backstory and Giles does a phenomenal job of giving a detailed and enchanting story within a story. I almost wished we could get more of these moments, the women in particular of the Lowlands seemed to have lived fascinating lives. I would love to know more about Ripper and even Versailles. My only very minor, minuscule complaint would have to be Zoe. She wasn't my favourite character ever - I found her a bit annoying at times. There were times when she only thought about herself, I know that a character flaw shouldn't make me hate a character, because they have flaws to be realistic, but sometimes her selfishness was so blatant it was irritating. Overall, I think I liked the first book because it was different, but I liked this book because it was really well planned out. There was almost a mythological quality to the way Giles set the story.